Hey guys! I haven’t uploaded in such a long time as I have been soooo busy with university. You know when you have a million and one things to do, but you don’t know where to start and it is all due around the same time??? yep.. that’s me! But today I have something very exciting for you guys and I feel like it is the perfect time for me to upload. The stress from uni is making me want to have a cosy night in and just relax and feel pampered! Nothing beats having a cosy night in, just trying to relax and forget about everything! I find this helps me so much, if I am feeling stressed or anxious and I feel like I just need to forget about the world and its worries for a good couple of hours. One of my all time favourite things ever, is running myself a lovely warm bath. Grab your favourite bath products, whether this be bubbles, bath oils or even bath salts and put them in the bath! 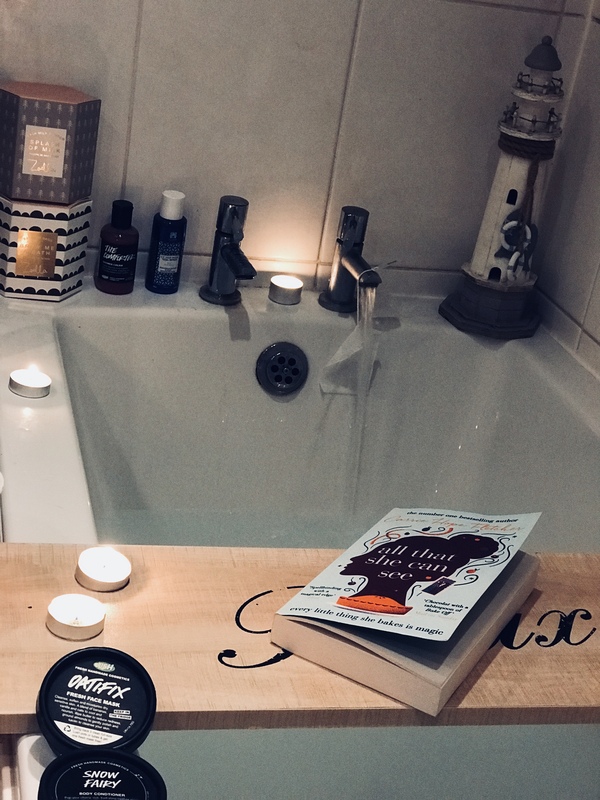 At the moment I am currently loving using Zoella’s Brew me a Bath gift set as I like going being the bath milk and the tea bags, they smell AMAZING! 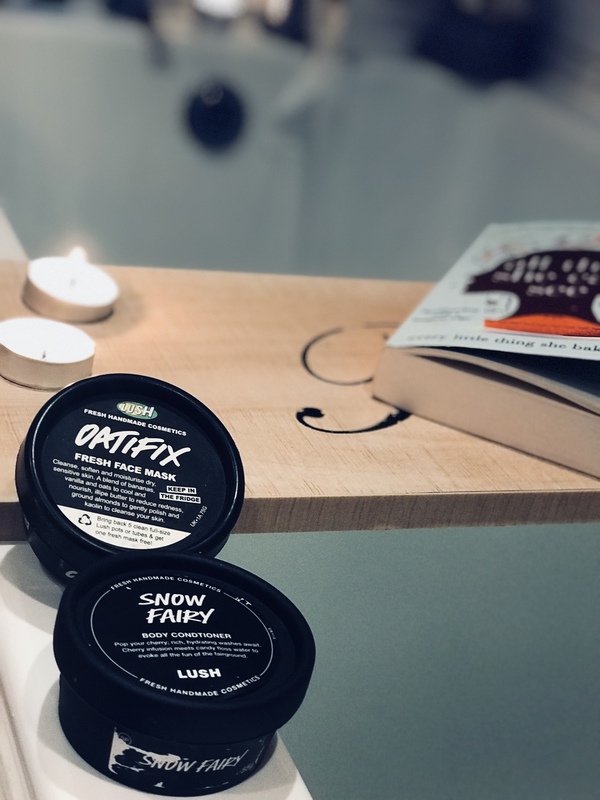 I also love using Lush products and I have one on my bath tray. I have the Metamorphosis bath bomb and it is amazing! 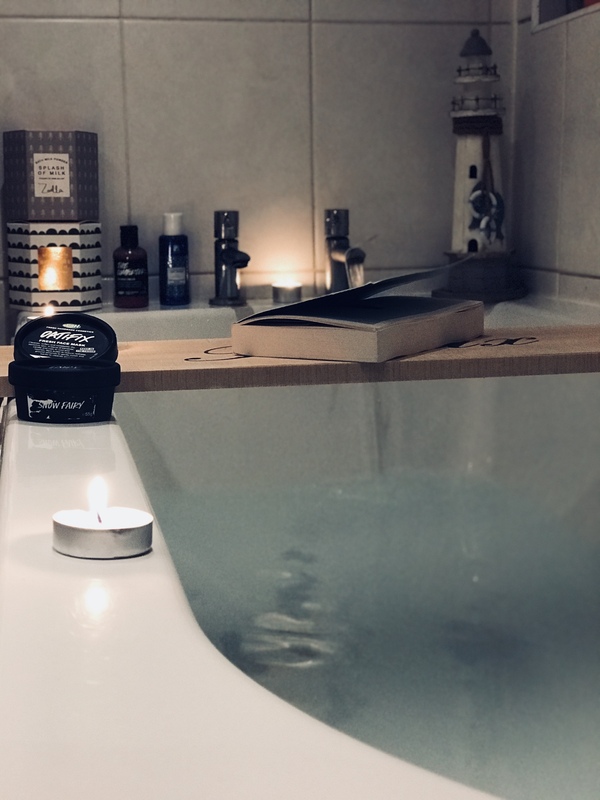 When I am in the bath, I love being able to relax and just do whatever I want to do, whether this be watching some Youtube, reading or even just scrolling through my social media. I find that having a bath allows me to really relax but also to reflect on my day, which I think is the best way to end any day. You can’t have a cosy night in and not have a face mask?! come on.. face masks are great because there is one for literally everything. After a long day or even a stressful week, it always takes a toll out on my skin, mostly causing it to be dry and maybe a bit spotty. Therefore, having a face mask that I can just slap on and it will make my skin look and feel better is such an essential, ALSO it will help you to relax even more. Most of the time face masks mean that you have to just sit still and not talk and I think this is partly the reason as to why it relaxes me so much. I know I can’t talk and I just need to sit there and enjoy it haha! After I shower or have a bath or normally find that I don’t have time to moisturise my skin, because it does take up a bit of time and most of the time I just can’t be bothered. However, after you have had your bath get your favourite body lotion and just smother your body in moisturiser and you will honestly feel so much better. Especially when your skin is feeling dry and needs a little moisture. After I have made a conscious effort to moisturise my whole body, I always feel better about myself like I am really giving myself some self love and caring for my skin! I like using the Soap and Glory Righteous Body Butter or the Zoella Candy Cream body lotion as I find that when I have moisturised my skin, it doesn’t stay sticky and it sinks right into my skin real quick. This is such an essential! This is literally going to transform your ordinary night into a cosy night in! Light some candles and turn your lights off, you could even do this in the bath, which is what I normally do when I just want to sit there and think. This will make you feel so cosy and stress free, and it will also make you tired too which is what you want just before bed. I like to light normal tea light candles and just place them around my room so I have light coming from everywhere in my room. I sometimes like to light ones that have a smell to them, so my bedroom smells nice when I am going to go to bed. Fairy lights are an all time favourite for me. I have them on around Christmas time aswell. They instantly make you feel warm and cosy and just glad to be indoors. 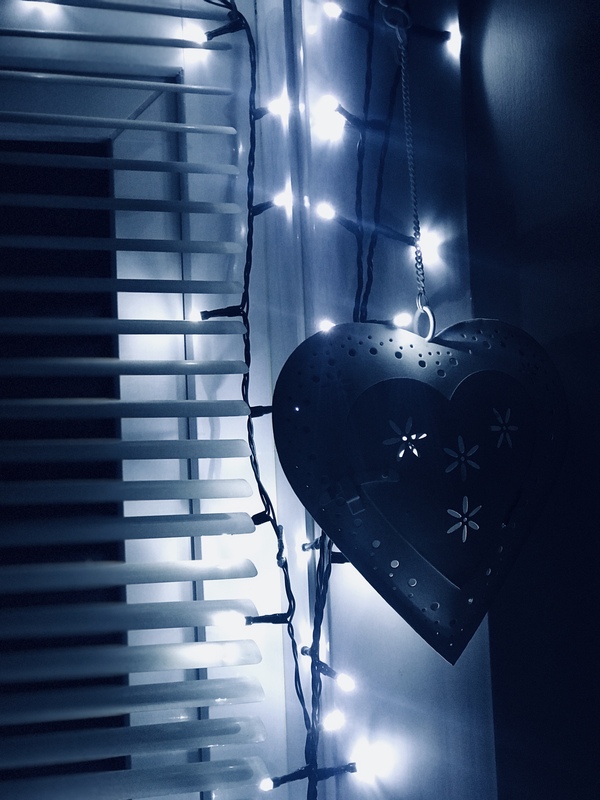 I have Christmas lights around my window because I like the blueish colour they are and I really like the black cable aswell, it just gives my window a little effect to it. You can normally get fairy lights from anywhere, you can even get the ones that are battery operated which are good. I have fairy lights around my window and I also have some hung up on my wall above my bed so I can turn those on and it just makes my room look so cute! This is a newer one for me and I have only been doing it for the last couple of nights, but I have noticed such a change in the way I feel before bed. Get an incense stick and place it somewhere around your room, light it and let the smell fill your room. I like to have mine near my window just in case. 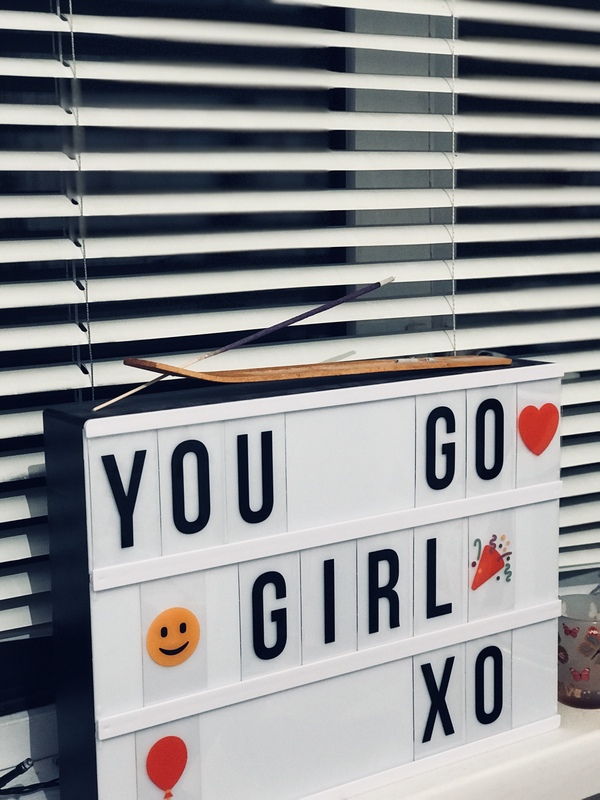 I have mine placed upon my light box because I can see it from my bed. I have been using lavender ones because lavender helps to relax you. I have noticed such a difference when I have been using this about half an hour before going to bed. The smell of lavender fills my room and makes me feel so relaxed before bed, I have been really enjoying it. Painting my nails when I don’t have acrylics on really makes me feel happy and fully pampered. I also have a gel set at home and this is literally a life saver, would 100% recommend getting one. I hate it when my nail varnish chips, so sitting down and painting my nails and making them look nice always makes me happy. This is also going to make you feel good when you next look at your nails and know you made an effort with them. I also find it quite therapeutic because I like to have a little think when I am doing it. 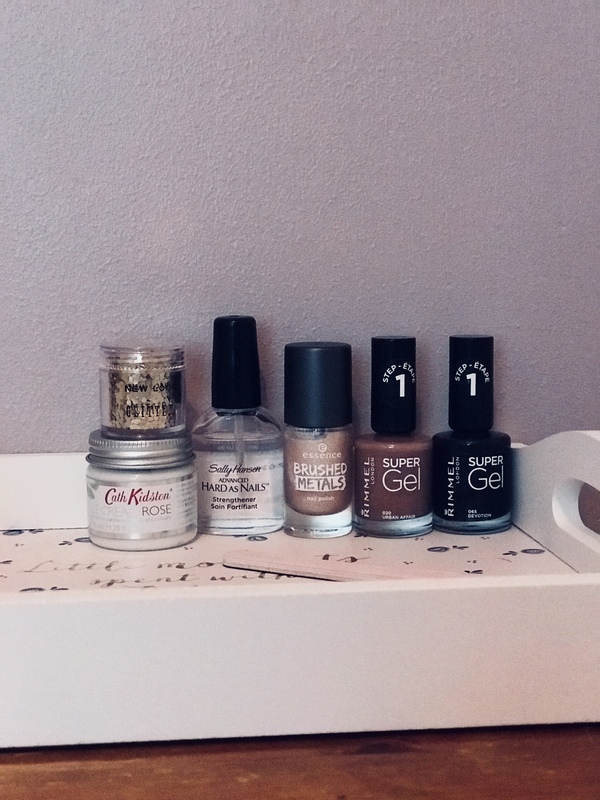 I have really been loving the Rimmel Super Gel nail varnishes and the Essence Brushed Metals nail polish. I also like to use the Sally Hansen hard as nails to make sure my nails are strong and I like to use the Cath Kidston cuticle cream. I always have maybe some glitter or something else just in case I want to get creative. A nail file is also always at hand. Depending on what mood I am in I will sit down and watch something that I love. Most of the time it varies between Youtube, Netflix and film or just some trashy TV. I like feeling so cosy in bed and love the feeling of just sitting there and chilling. I like to put my phone away and just really get into what ever it is that I am watching. I like being able to take minutes or maybe even hours out of my day, to focus on something else. I find that this is such a good way to unwind and chill out. 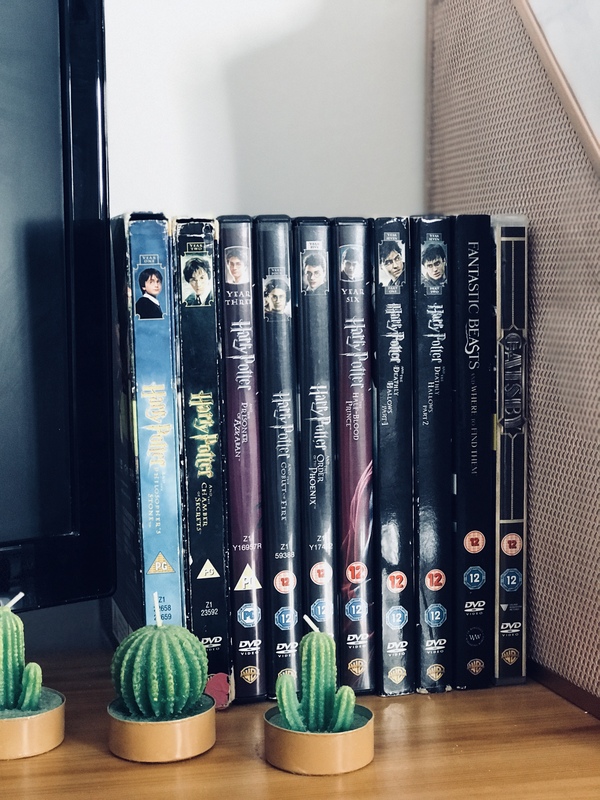 I am always obsessed with watching Harry Potter films (as you can tell by my beat up Harry Potter cases, they have been around for a while) Harry Potter are my absolute favourite films, I know everything inside and out and have been a massive Harry Potter fan for years! I have also really been loving watching Lucy Sheridan’s Instagram stories, she seems like such a lovely woman and is always talking about life lessons such as how to focus on yourself or how to get motivated.. I find it really motivating to watch and listen to. I have been loving Patricia Bright on Youtube, she is my go to at the moment on Youtube. I always struggle to keep up with reading these days. I have so much word going on and I find it hard to just sit down and read. Having a pamper night in is good because I know I can make the effort to put all work aside and just read. I also find that reading before bed is so good and makes me feel so much better about myself, rather than just sitting there and being on my phone. Okay, this one sounds abit weird.. but, if I know I have all evening to chill out and feel relaxed I will do my hair. After I have had a bath I will go up to my room and put lots of product in my hair and then dry it and style it however I want to. It also means that the next day your hair will basically be done, just give it a quick brush and you are ready to do. I have been recently liking using the TRESemme Heat Defence, TRESemma 24 Hour Body Blow Dry Lotion and the All Natural Coconut Oil. I use these products every time I wash my hair anyway, but I don’t always style it the same evening. My hair is in such good condition when I use these three products and when I use my GHD’S to straighten my hair it feels and looks so nice! I also think that it makes you feel a bit better, because you aren’t just whacking your hair up in a bun and sitting in a cosy jumper, you look partly alright haha! Every single night I will have a tea, but before bed I like to have a fruit tea. SO GET YOUR FAVOURITE HOT DRINK, WHATEVER THIS MAY BE! I find that this makes me feel so good, especially when I have a fruit tea as there isn’t many calories in one. Sometimes it is nice though to have a great big hot chocolate with cream and marshmallows! I have been really loving the Knightsbridge Apply & Pear infused tea, IT IS DELICIOUS! it is soooo good. It tastes like you are literally drinking apple juice and i love a good apple juice. 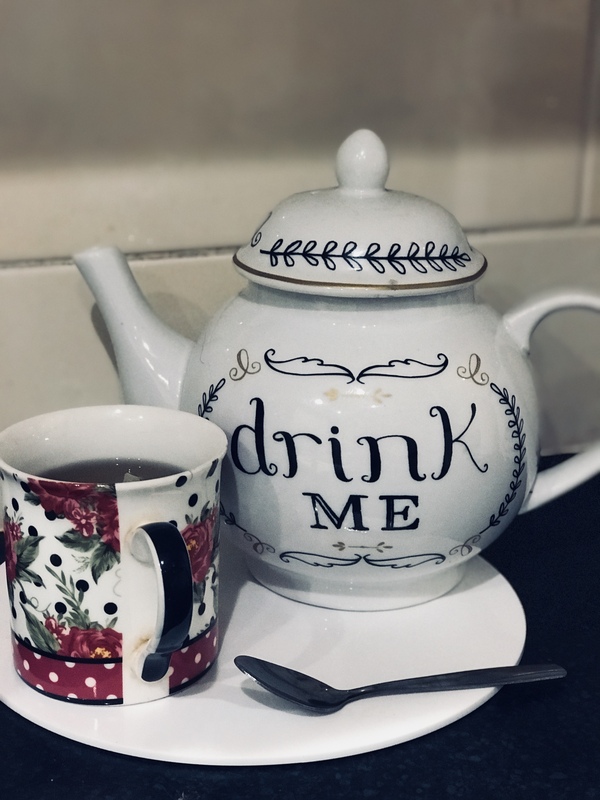 After 7 onward i will try and stick to a fruit tea instead of having a tea because it just makes me feel so much better and as if it almost clenses me. I also find that it makes me feel relaxed and warm. I am one of these people who will sleep in a t-shirt or joggers if they are the cosiest things ever! therefore, wear anything that you find cosy and that you just love to wear. If you want to bomb around in some fluffy socks and your cutest pjs with a warm dressing gown, DO IT! or if you want to whack on a hoodie with joggers and slippers, DO IT! Be comfy and feel comfy. At the moment I am loving wearing my new pjs that I got from Boohoo they have glitter lips all over them. I like wearing these beause they are so comfy and I know that if I get too cold I can just put on my dressing gown. I also love wearing fluffy socks, if you moisturise your feet and then put fluffy socks on IT IS THE BEST THING and you feet will be so moistured and just taken care of! S N A C K S ? Having a cosy night In wouldn’t be the same if you didn’t have any snacks! if you are trying to stay healthy, that’s fine! get some humus and carrot sticks or even some low calorie popcorn. If you are someone who is like “I WANT FOOD” then get a pizza, get those wedges and get those yummy dough balls! whatever you want to get, eat it and enjoy it. Sometimes I love snacking on giant flavoured corn or flavoured chickpeas, they are still healthy but obviously if you dont have too much. I also love having sorbet or frush fruit and greek Yoghurt! What do you like to do when you have a cost night in? Yes, it is the best. I am kind of glad that someone else did, it doesn’t make me look as crazy! they are! if I took them down, it wouldn’t be the same! This sounds perfect! I just love cosy nights in.